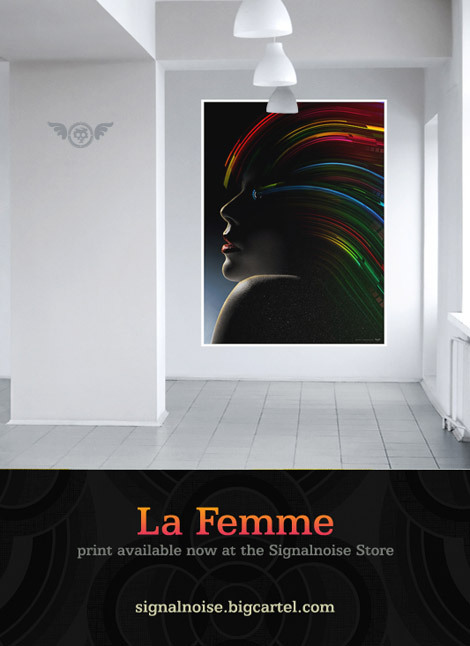 The La Femme poster is now available to purchase at the Signalnoise Store. It is 18″ x 24″ on poster stock, semi-gloss. This design is also available as Wallpaper of the Week over at Abduzeedo.com. You can download La Femme at a variety of different resolutions for your computer or iPhone. Check it out and download right here. Reminder: The draw for the Atari and Robot Rock prints is this coming Thursday. If you want to enter the contest, just leave a comment on the post and tell me your favorite video game of all time.